Smacksy Saturday Photo: The Stomp Rocket - . Catching air over the stomp rocket. I wish you a whole day of this feeling. What a fabulously perfect picture!!!! Ryan use to love his Stomp-Rocket! Ah childhood!! Wow, that is a really great shot! I bet it was a tricky one to nab too! 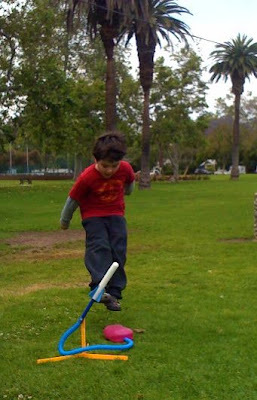 I need to look into nabbing a stomp rocket, I bet my kids would have a blast with it. You know, we've got to give one of those a go again. Last time Mooch tried, she didn't have the balance or strength to achieve lift-off, but I bet she could launch one now. Thanks for the inspiration once again, Bob.